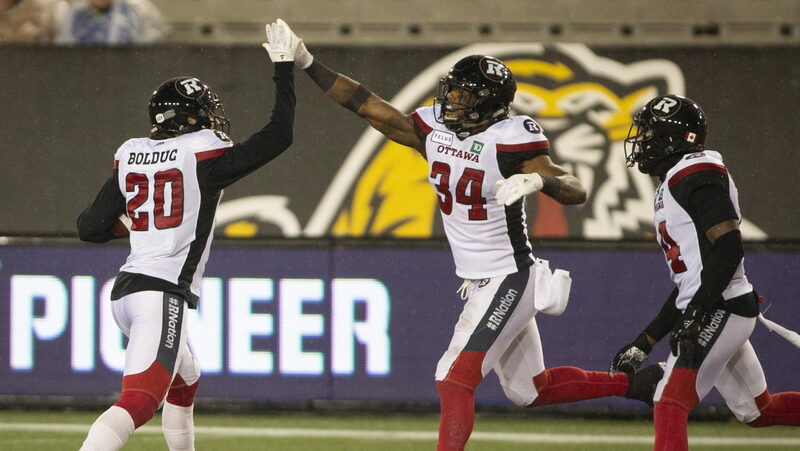 The rain may have been coming down sideways, but it didn’t matter to the Ottawa REDBLACKS as they clinched the East Division title by beating the Hamilton Tiger-Cats 30-13 at Tim Hortons Field. Both teams battled through miserable, windy conditions throughout the game. Trevor Harris was 23-for-30 passing and threw three touchdowns. Brad Sinopoli had seven receptions, breaking the record for most catches in a season by a Canadian receiver. The REDBLACKS defence picked off Jeremiah Masoli twice in the fourth quarter and kept the Tiger-Cats out of the end zone. Jonathan Rose and Devin Butler paced Ottawa with four tackles apiece. Both teams struggled to move the ball against a brisk wind in the first quarter. Ottawa began winning the field position game, and capitalized on a few Hamilton penalties to get the ball to the red zone. Harris then hooked up with Greg Ellingson in the end zone. A two-point convert made the score 8-0 early. 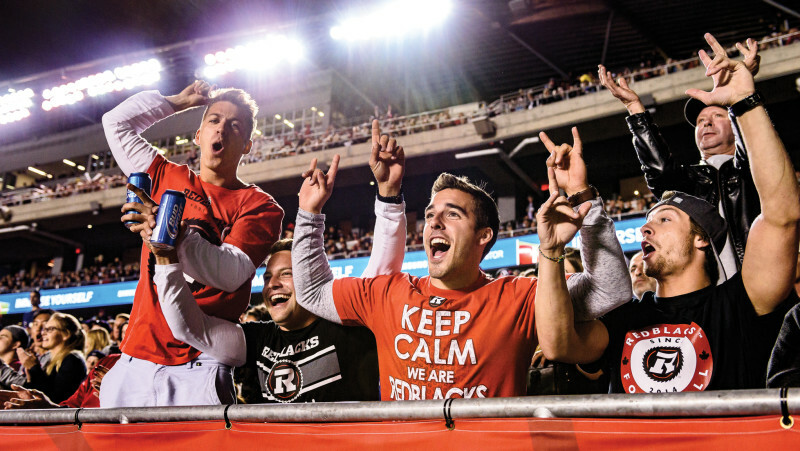 Hamilton earned a safety and a field goal, but Ottawa extended their lead via some trickery. Dominique Davis went under centre and looked like he was going to plunge forward. Instead, he dropped back and found a wide-open Ellingson for a 55-yard catch-and-run. The REDBLACKS continued to pile it on with the wind at their back in the second quarter. Harris fired down the field to Diontae Spencer who held on while falling backward in end zone. Spencer was effective in the return game all day, and got in on the offence to make the score 21-4. The Tabbies weren’t going away however, as Masoli guided his team down the field. Lirim Hajrullahu kicked a 35-yard field goal – a difficult make considering the wind and rain. Hajrullahu then did one better, converting from 43 yards as time expired. The score at the half was 21-10. Ottawa continued to limit their opposition to three-pointers in the third quarter, with Hajrullahu making the score 21-13. The REDBLACKS used a big play to add to their lead near the end of the third. Harris fired a bomb down field and Spencer caught it and darted into the end zone for a 79-yard strike. The two-point convert failed, but Ottawa held a 27-13 advantage. Hamilton was driving midway through the fourth, but Sherrod Baltimore went up and got his second interception in as many weeks. The turnover ended a dangerous Tiger-Cats drive. A J-P Bolduc pick on Hamilton’s next drive sealed the victory for the REDBLACKS, sweeping the season series with the Tabbies in the process. 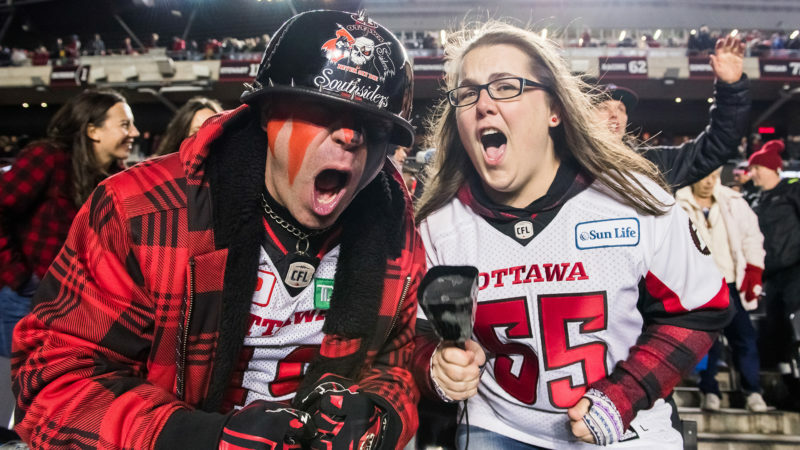 Ottawa clinched their third regular season East Division title in four seasons, and the semi-final playoff bye that comes with it. 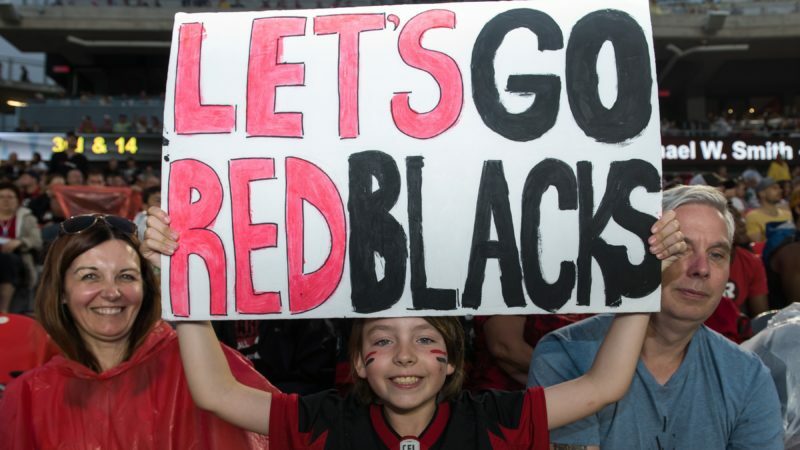 The REDBLACKS (10-7) will close out their regular season next week against the Toronto Argonauts at home. Kickoff is scheduled for 7:30 p.m. on Friday, November 2. Hamilton (8-9) are slated to take on the Montreal Alouettes on November 3, before preparing for the East semi-final the next week. » Score your playoff tickets now! William Powell did not dress for the game… Brad Sinopoli broke the record for receptions by a non-important receiver in a single season. The record was previously 112 catches and set by Ben Cahoon in 2003… Lewis Ward has missed more extra points than field goals this season… Trevor Harris and Jeremiah Masoli surpassed the 5,000-yard plateau for the first time in their respective careers… Diontae Spencer surpassed 1,000 receiving yards for the first time in his career.